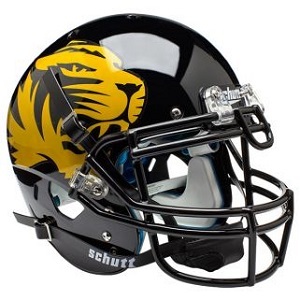 This is the University of Missouri Tigers Shiny Tiger XP Helmet by Schutt. 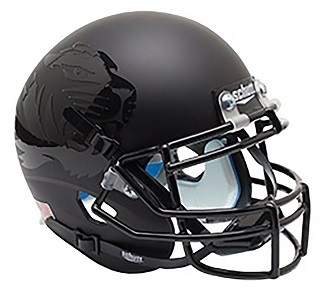 Both the Authentic and the Replica feature a full-size glossy black AiR XP helmet shell with official Mizzou helmet decals, an authentic black facemask and 4-point ION hard cup chin strap. The Authentic has the complete authentic interior TPU cushioning set complete with TPU jaw pads. The Replica does not include full interior pads or the facemask noseguard. Great for autographs and display. Not to be worn or used for play. This is the University of Missouri Tigers Chrome Mask XP Helmet by Schutt. Both the Authentic and the Replica feature a full-size matte black AiR XP helmet shell with chrome tiger helmet decals, an authentic chrome facemask and 4-point ION hard cup chin strap. The Authentic has the complete authentic interior TPU cushioning set complete with TPU jaw pads. The Replica does not include full interior pads or the facemask noseguard. Great for autographs and display. Not to be worn or used for play. 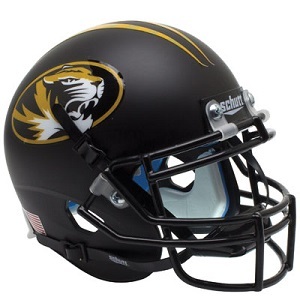 This is the University of Missouri Tigers Matte Black XP Helmet by Schutt. Both the Authentic and the Replica feature a full-size matte black AiR XP helmet shell with large tiger helmet decals, an authentic black facemask and 4-point ION hard cup chin strap. The Authentic has the complete authentic interior TPU cushioning set complete with TPU jaw pads. The Replica does not include full interior pads or the facemask noseguard. Great for autographs and display. Not to be worn or used for play. This is the University of Missouri Tigers White Chrome Mask XP Helmet by Schutt. Both the Authentic and the Replica feature a full-size matte white AiR XP helmet shell with chrome tiger helmet decals, an authentic chrome facemask and 4-point ION hard cup chin strap. The Authentic has the complete authentic interior TPU cushioning set complete with TPU jaw pads. The Replica does not include full interior pads or the facemask noseguard. Great for autographs and display. Not to be worn or used for play. 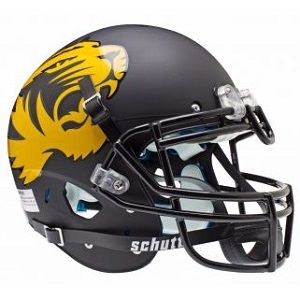 This is the University of Missouri Tigers Matte Black with Oval Tiger XP Helmet by Schutt. Both the Authentic and the Replica feature a full-size matte black AiR XP helmet shell with oval tiger helmet decals, an authentic black facemask and 4-point ION hard cup chin strap. The Authentic has the complete authentic interior TPU cushioning set complete with TPU jaw pads. The Replica does not include full interior pads or the facemask noseguard. Great for autographs and display. Not to be worn or used for play. 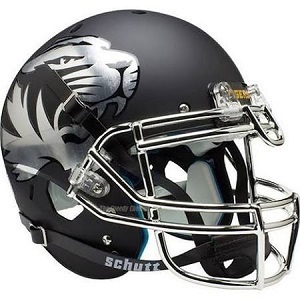 This is the University of Missouri Tigers Black on Black XP Helmet by Schutt. Both the Authentic and the Replica feature a full-size matte black AiR XP helmet shell with black tiger helmet decals, an authentic black facemask and 4-point ION hard cup chin strap. The Authentic has the complete authentic interior TPU cushioning set complete with TPU jaw pads. The Replica does not include full interior pads or the facemask noseguard. Great for autographs and display. Not to be worn or used for play. This is an Authentic Missouri Tigers Speed Helmet by Riddell. 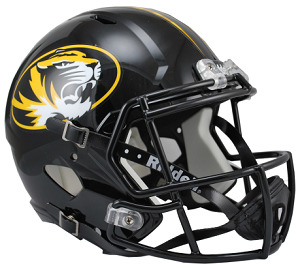 This full size Mizzou Speed helmet features the authentic Riddell Speed helmet design. It is designed with extended jaw area protection, a polyvinyl-coated steel face mask, 4-point chin strap, authentic interior padding, an integrated facemask attachment system and elliptical air vents. Great for autographs. Helmet size is 13.5"(L) x 9.75"(W) x 10.25"(H). For collecting and display only - not to be worn. 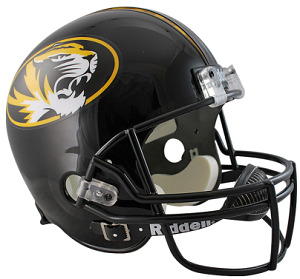 This is a full-size replica of the Missouri Tigers Speed Helmet by Riddell. The helmet has the same great features as the authentic Mizzou Speed Helmet but does not include the full interior padding ... just molded foam jaw pads. Great for autographs and display.Dimensions: 12.75"(L), 9.25"(W), 9.75"(H). 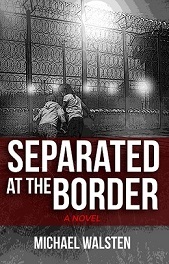 Not to be worn. 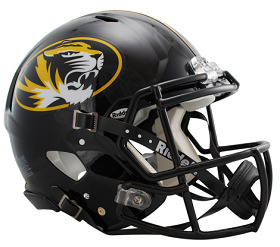 This is a full-size replica of the Missouri Tigers Riddell VSR4 ProLine helmet. 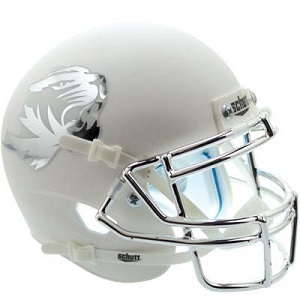 The size medium shell features official Tiger helmet decals, uses the same polyvinyl-coated steel Z2B facemask as an authentic VSR4 helmet, has a 2-point chinstrap and is approx. 9.5" tall. Interior padding is not authentic. Ideal for autographs or display. Not to be worn or used for play.